We knew that it was going to have to be a quick in and out trip since Melanie couldn’t take time off from work, but neither of us had ever been to the Pittsburgh side of Pennsylvania and we wanted to make the most of the little time we had. The groom gave me a list of attractions that included Fallingwater! I had completely forgotten that it was in the area and was less than an hour away. Decision easily made as this was one of the two remaining buildings on my list to see before I die. For those who didn’t start their college career in architecture, you may not be familiar with Fallingwater or possibly even Frank Lloyd Wright. According to the American Institute of Architects, Frank Lloyd Wright is the “greatest American architect of all time” and Fallingwater is “the best all-time work of American architecture.” To steal a phrase from our pulpit minister, if you don’t think this place is important or special, it probably says more about you than Fallingwater. The morning after the wedding we hopped in the rental car and headed for the boonies. 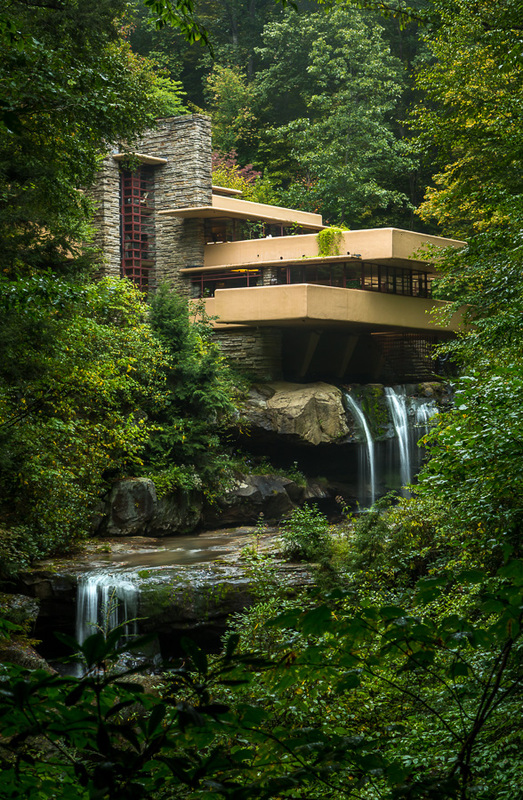 You see Fallingwater was a weekend retreat for the wealthy owner of a department store chain. It was designed for a piece of family property outside of Pittsburgh that was up in the mountains with a nice little creek cutting across it forming a series of waterfalls. 1. It was built on top of the creek/falls. Rather than being positioned to to take advantage of a waterfall view, the structure interacts directly with the water – decks cantilever over the water, stairs lead down into the creek and a swimming pool from the living room, air off the creek is used to cool the house in the summer, the sound of the creek in the living room, etc. 2. 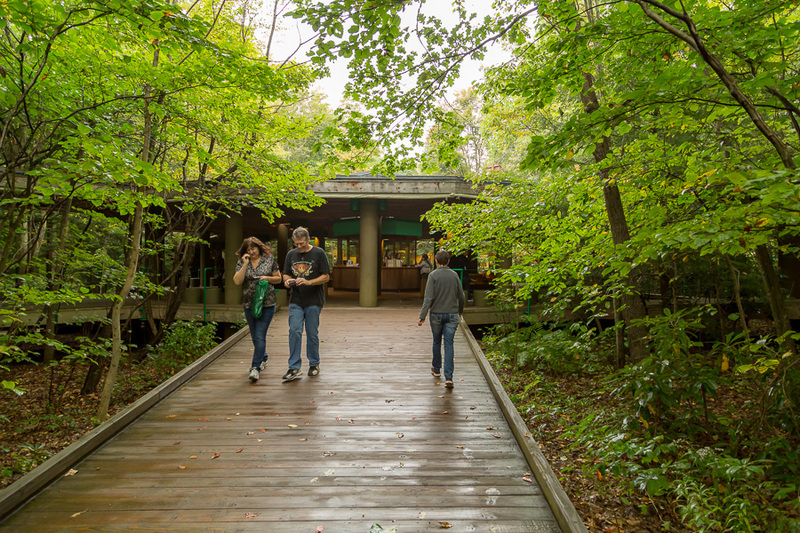 The way in which the building’s shapes, colors, and materials are all informed by the immediate landscape (organic architecture). The basic shapes of the home mimic the shapes of nearby rock formations. In fact the home appears to be growing out of the rock in places. The hearth of the fireplace is actually just the stone that was already there that was left protruding up through the floor. 3. The blurring of indoor and outdoor spaces. Views from windows, rooms with large decks, removal of room corners (glass walls touch each other), wall and lighting placement that pushes (or draws) the occupant toward the natural spaces. One of the most amazing things to me about this place is not just what it achieves but when it achieves it. Sure the Japanese had already been doing stuff with some of these ideas but this house was built in America in 1937. Think about that for a moment. In 1937, Disney’s Snow White and the Seven Dwarfs is in theaters. J.R.R. Tolkien’s book The Hobbit is published. Cars look like this and are advertised like this. Sure, there was modernism, art nouveau, art deco, and the like, but it seems that most homes of the period are this and this and this. I don’t think it’s until the 1960’s or 70’s that many of FLW’s concepts are widely appreciated and adopted. What else can you think of that was 20 or 30 years ahead of its time? We arrived on a foggy rainy Sunday morning for the first tour of the day (book ahead on the website) and the parking lot was pretty full. There were enough people ahead of us that we were in the 7th tour group. I couldn’t believe it! Luckily, tours move quickly and like clockwork. I guess having more than five million people visit (about 150,000/year) forces one to make accessibility a strong consideration and the non-profit that now runs the home/museum has done a great job with the addition of a visitors’ center and decent sized paved parking lot. While we waited our turn, we wandered around the gift shop and restaurant and if we had been there at lunchtime would have probably eaten there. The food looked like it was pretty good. In a short period of time, they called our group and the tour began. Our guide was knowledgeable and we got to see entire place: main house, garage, and guest/servants’ quarters. Because the home is small and very crowded, you are not allowed to bring in a camera or any other protruding objects like a big purse that could wack into stuff. No pictures are allowed inside the house but you can walk the grounds after the tour and take pix from the outside. What is really cool is that, unlike a lot of other historic places where you walk on a roped off path, Fallingwater is set up exactly as it was in use. You walk around and experience most of the spaces as the owners did. You just can’t touch anything. It was wonderful. Melanie and I would be happy to live someplace like this one day. You feel like you are in a tree house and in a waterfall and in a safe cave. There are a lot of beautiful views out of the house on the completely undeveloped woods that surround it, but from the outside, there are not that many places to see the house. This isn’t a big deal except that you can only photograph the home from the outside. As a series of overlapping cantilevered rooms, the floor plan for this house is rather complicated to understand and envision. It is a building that really improves when you get to experience it first hand rather than just pictures and drawings. The connection to the surrounding landscape is the strongest that I’ve ever experienced in a building. The structure’s location is an essential part of the overall design and you are reminded of where you are at every location in the house. It is small. It has very little storage. I had to be reminded that this was a weekend retreat and a place for entertaining not a primary residence. Once you keep that in mind, it makes a lot of sense. All of the auxiliary rooms and hallways suggest that the main living space and the decks are where you want to be. I enjoyed listening to other folks’ comments as we strolled the grounds afterward. Some people loved the house and were ready to move in. Some loved the art collection. Some wished there were no guides because people tend to look at the guide instead of the house as they move through it (an accurate observation). Of course, some didn’t care for it much. One woman let her companion know that it would be a fine place to live if you could “do a total gut job inside.” Another said that it was ok but Kentuck Knob (another FLW house down the road) was better because <reasons for day to day liveability>. It is so easy to pick out details and design ideas at Fallingwater that are replicated in buildings today. It is sort of like movies pre and post Star Wars. You see the hand print on the things that come after. If you are ever in the area, I highly recommend making tour reservations and experiencing Fallingwater. They are open rain or shine, and in fact, a couple of the guides commented during our rainy tour that they actually prefer rainy days. The water level fluctuates several feet during the year. I would think going when there was a stronger flow of water than when we went would be optimal, but it is not necessary. Off the bridge and headed for the front door. Driveway continues past house, turns, and ends at large hidden garage. Fountain to wash up in after playing in the woods. Off to the side of the front door. I didn’t realize the depth and texture of the stone walls (all locally quarried) until we saw them up close. Up the driveway looking back down at the house. A deck merges with the boulders beside it. Great review and pictures! Makes me want to visit if we’re ever nearby. Oh, and I forgot to mention just how easy it is to get there. 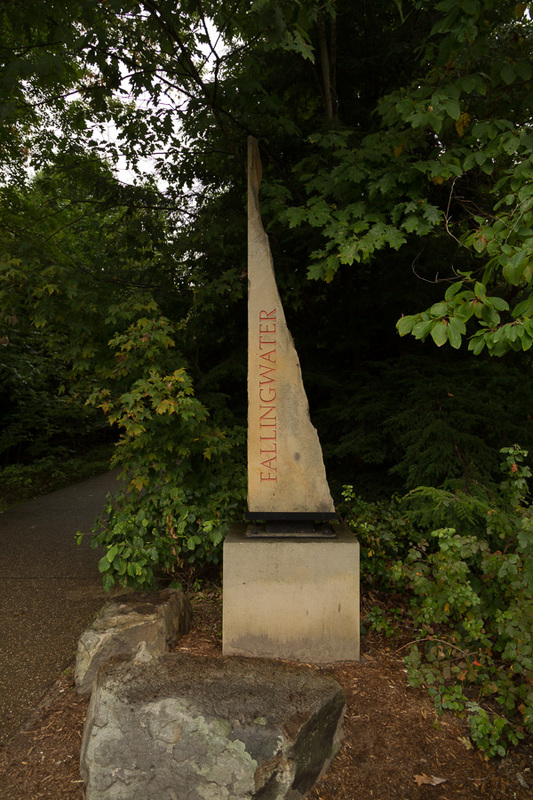 Just type “fallingwater” (one word) in a Google search and then click on “directions” on the thumbnail of the map that pops up. The marker that comes up is correctly placed right on top of the main house. glad you finally got to go! Have you been to the one in Florence? Nope. Haven’t made it over there yet.